So You Want To Be a Living Kidney Donor!! 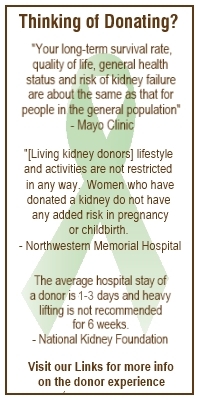 The Living Kidney Donors Network (LKDN) and the Alliance for Paired Donation (APD) are two such organizations. They have come together to offer the first webinar to educate those who want to learn more about the process of donating a kidney. The webinar will educate you about the living kidney donation process, from the donors perspective. Anyone who is interested in being a living kidney donor should attend. Those in need of a kidney transplant will also benefit by learning more about the donation process from the donors perspective. Some donors have had a difficult time explaining to their friends and family members their interest in donating. The webinar will provide you with information on how to express your interest in being a kidney donor. The webinar is FREE. You can attend the webinar by using any computer that has broadband internet access. If you don’t have access to the internet, you could listen to the presentation via the telephone. Click here to register and for telephone dial in information if you prefer a phone to the computer.